You can download the full version of Leisure Suit Larry in the Land of the Lounge Lizards from the download store listed below. NOTE: This game can be played under Windows using the ScummVM engine recreation (please see the links section below). He's just turned 40, and he's still single. If you can get past the glow of his Grecian formula, you can see his hairline beginning to make a hasty retreat from his forehead. Larry's leisure suit is of the highest quality (100% manmade material, permanent press too!). He wears at least 11 gold chains and his freshly-capped teeth could blind you in a bright light. Down at the singles bar he tells the chicks, "Sure, I'm single... I got in a fight with my ol' lady and she threw me out." He doesn't tell them the "ol' lady" was his mom, or that he was 38 at the time. He's the original blind date nightmare. The kind of guy you wouldn't want your daughter to date, let alone meet. But he's also the unlikely "hero" of this new 3-D Animated Adventure Game from the makers of the King's Quest series. 3-D EQUALS DANCING, DRINKING AND DAMES! Become the loveable nerd Larry for one fabulous night. You'll dance. You'll drink. You'll gamble. And, if you play your cards right, you might even meet the girl (or girls) of your dreams. 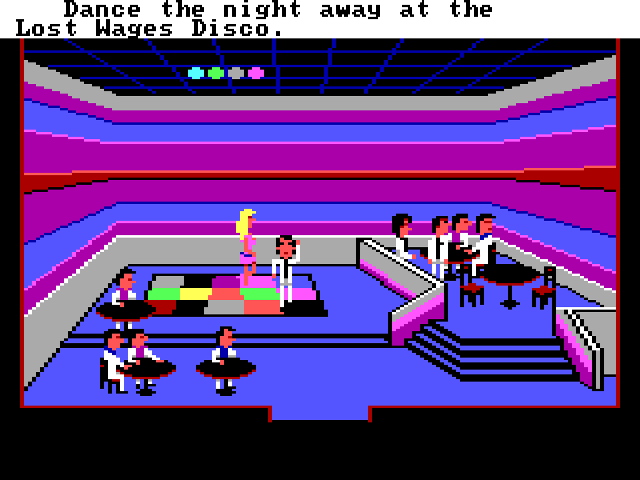 Leisure Suit Larry is a humorous, harmless endeavor for adults. The object of the game is to help Larry overcome his jerkisms and lose his "you-know-what." It's a silly, risque romp through the singles scene and a challenging adventure game that will test your street smarts and suave sophistication. So, slip into your leisure suit and venture out into "the land of the lounge lizards." We guarantee it'll be a night you will never forget.